In 2016, the Tata Memorial Centre (TMC) in Mumbai will celebrate its 75th anniversary, with three major events scheduled throughout the year to commemorate this momentous milestone. This first event, entitled “A Conference of New Ideas in Cancer,” will take place Feb. 26-28, 2016, and will be hosted at the Tata Theatre, National Centre for the Performing Arts, in Mumbai. The American Association for Cancer Research (AACR), along with the U.S. National Cancer Institute and Lancet Oncology, is supporting this event to advance international cancer research. This conference will explore the serious issue of cancer through a rather iconoclastic approach. Participants and panelists will reflect on whether current research and therapeutic strategies are appropriate and the resources available are utilized in meaningful ways. The overarching goal of the discussions is to challenge the current dogmas and debate the ‘currently entrenched versus contrarian viewpoints’ in cancer research and treatment. It is my pleasure and a true honor to represent the AACR on the conference’s program advisory committee. For three days, clinical researchers, basic scientists, public health experts, and policymakers will participate in a broad, multidisciplinary program of keynote addresses, symposia, and invited lectures. Topics we will cover include the fundamental cancer principles, experimental models, laboratory science, clinical trial and statistical methodologies, screening tools, diagnostics, treatment strategies, and many other aspects pertaining to processes that define the current ways of clinical practice and research. This engaging program will also feature debates on whether targeted therapy approaches to treatment are fulfilling their promises, or whether precision medicine is an achievable goal. You can find the program highlights for this truly innovative and unique conference as well as information about registration and abstracts submission here. Professor Varsha Gandhi, PhD, received her doctorate degree in biochemistry from Delhi University in India. After a brief period at Rice University, she joined MD Anderson Cancer Center as a postdoctoral fellow and was promoted to assistant, associate, and full professor. 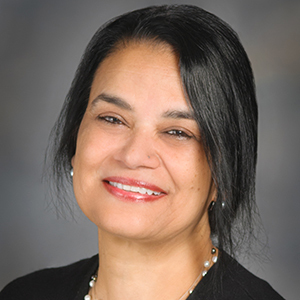 Currently, she is a Rebecca Meyer Brown & Joseph Mellinger Brown chair in basic science research in the Department of Experimental Therapeutics, Division of Cancer Medicine at The University of Texas MD Anderson Cancer Center in Houston, Texas. She is ad interim chair for this department and also serves as director of the Center for Targeted Therapy. She is also a faculty member of The University of Texas Graduate School of Biomedical Sciences (GSBS) in Houston, Texas. She has been a member of the AACR since 1988.